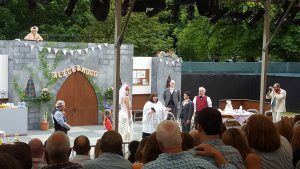 The vicar of Dibley is a classic 90s sitcom that everyone loves so I was thrilled to go along to see a live version of it at the Open Air Theatre Festival in Sophia Gardens. Following a relaxing time with a Cardiff no.10 drink and a Grazing shed burger, we headed into the theatre itself and the show began. Each actor brought their well-known and well-loved character to life through their voices, accents and even mannerisms. Each and every character was played really well. As soon as Geraldine was introduced with a bright yellow mac on, I knew it was going to be a funny show. The performance included some classic scenes remembered from the show. Owen proposing to Geraldine, Hugo finally standing up to his dad (which rendered applause from the crowd), and Alice and Hugo’s first kiss to name a few. How the actors kept kissing for that long while so much was going on around them without laughing I’ll never know! The wedding scene was my absolute favourite. From the emblazoned ‘I love Hugo’ wedding dress, to Alice walking through the audience as an aisle with Frank having a ‘NOT Alice’s Dad’ poster attached to his back, to throwing the bouquet only to have Geraldine run into the audience to get it back, everything was hilarious and ultimately heart-warming. Much like the show itself. It’s not too late to see for yourself. 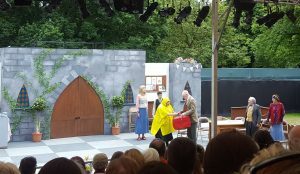 The Vicar of Dibley has performances daily until the 15th of July. Adding to that, the festival will also be having live versions of Macbeth and Aladdin later in the month so there’s something to suit everyone. To book tickets to any of these shows visit www.cardiffopenairtheatrefestival.co.uk or call 0333 666 3366.